A belated post from yesterday. Taking part in the Lindisfarne count in the morning, struggling to stand, I joined MH and JD at Budle Bay with highlights of a single Greenshank, 2 Little Egret and an immature Peregrine. On returning back home I headed out in search of geese, firstly down the Beehive road to check the Hartley fields where the Pink-Footed Geese have been feeding in regularly, no sign. Passing Deleval Hall I picked up a Common Buzzard hanging over the wood. 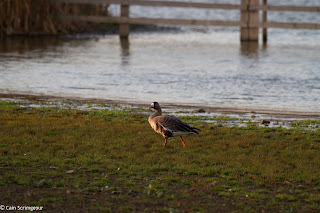 Hoping that the geese were in the West field I headed down to the members hide. My hopes were rewarded with what seemed to be a large number of geese, a high chance of a White-Front or Bean I thought. Instead of a Bean or White-Front catching my attention, 2 white geese did, Ross's Geese. In close company of 5 Barnacle Geese they were part of a larger 150+ Pink-Footed and 30+ Greylag. Unfortunately the geese lifted soon after and although the majority circled and landed again, the Ross's nor the Barnacle could be seen. 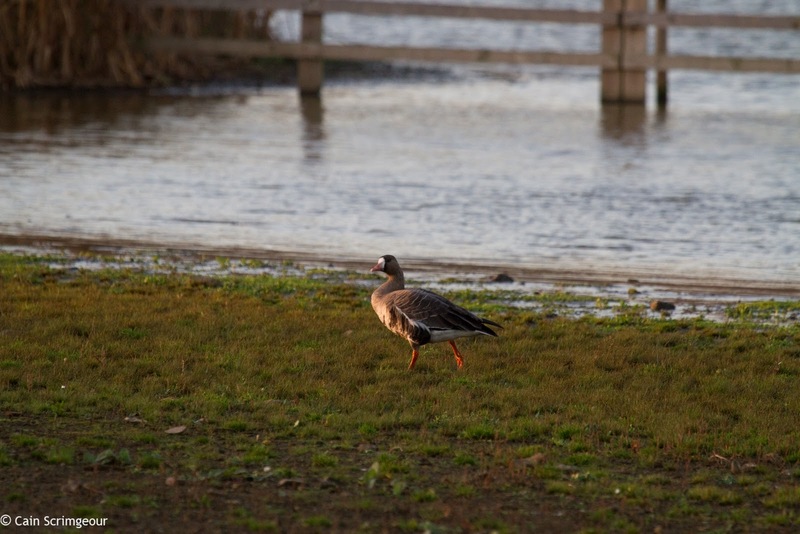 A check of the surrounding fields prove fruitless, although an adult White-Fronted Goose was on the public shore, it seemed to have a bit of a limp. Back to the hide to catch a few Starlings heading into the reeds to roost with BD, then a drive back to the Westside. Today I've been up at Caerlaverock. An impressive number of Pintail on the sea being the highlight.